Is it Possible to Use G Suite Creds for WiFi Access? Home » Blog » Active Directory » Is it Possible to Use G Suite Creds for WiFi Access? From a security standpoint, the first method is what I would call a minimal set of protections. A single pass phrase is easily shared and very hard to track if compromised. Using a conventional directory is more secure, but it can be a hassle. What if you’re a startup that doesn’t want the cost of maintaining clunky, on-premises servers? Or maybe you’re a more established company that’s ready to evolve with today’s faster, more decentralized way of doing business. 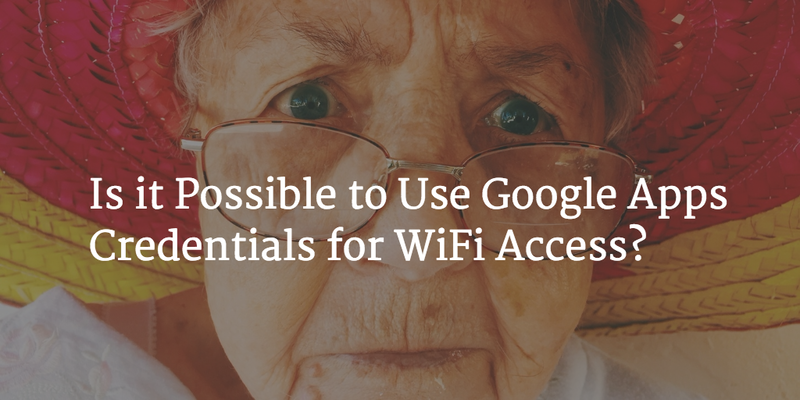 Either way, using Google Apps credentials for WiFi access is an appealing prospect. So is it possible? Yes. Google has done a tremendous job with their Google Apps for Work productivity suite. Not only have they challenged the once dominant Microsoft Office, their spirit of innovation and collaboration has allowed third-parties to build software and services on-top of their rock-solid infrastructure through the benefit of APIs. When done correctly, end users only need to add their credentials once and they’re the same credentials used when logging on to Google Apps. It’s easy for users – and IT likes it because it’s more secure and streamlined (no identity sprawl). Of course, it’s a bit more complicated than just snapping your fingers. Most organizations don’t have the expertise, time, or resources on hand to connect their WiFi networks, RADIUS/LDAP, and Google Apps Identities. Do you remember when we mentioned Google encouraging customization of their software through third-parties? People that specialize in this kind of thing have developed LDAP-as-a-Service and RADIUS-as-a-Service to streamline wireless access and security for companies. We’ve also recently put together a guide with the help of experts in cloud security at companies like Bitium and Spanning. It’s called “The Modern Office: How Google Apps Solves the IT Identity Crisis” and you can get it for free right here. The 45-page ebook includes a chapter about linking your WiFi network to Google Apps, along with sections on SSO, security and compliance, and directory services.